It’s hard to say who benefits more from backyard bird feeding – the birds or the people who feed them. Some of life’s moments that are more enjoyable include the songs and antics of the birds outside our windows. Watching them is so captivating that it can alter an entire day’s plans, turning a twenty-minute breakfast into a three-hour brunch. Activity at your feeder probably can hold your attention all day with its ever-changing pattern of form and color, from fluffed-up chickadees to sleek cardinals. Often the brightest spot on the winter landscape, with the most activity, is the bird feeder in the backyard. No matter what size yard or garden you have, you can create your own bird haven. All you need is food, water and shelter. Shrubs and evergreens offer cover during harsh northern winters and protect birds from their natural enemies. They also provide safe nesting sites in the spring. 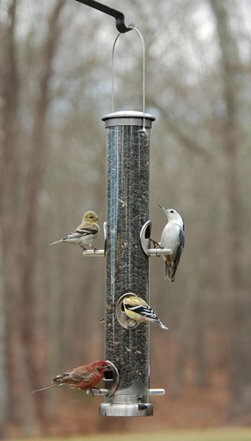 Consider making your bird feeding program easy and fun for the whole family. If the feeders are hard to reach, the bags too heavy for the kids to maneuver, or the birdbath too far from the hose, pretty soon family members will lose patience and object to being involved. Hang different types of feeders at different heights and near enough to your house so you can watch the birds at relatively close range. Don’t be discouraged if you have just put up a new feeder and the birds don’t flock to it immediately. Because birds recognize food by sight, it can take a while for them to locate a new source. Try putting aluminum foil on the ground underneath, where sunlight can be reflected. If you already have feeders, put the new one nearby until the birds discover it. Offering water will also attract birds. Put your birdbath in an open area, but near some trees or bushes to permit a quick escape if predators approach. Birds will visit regularly once they discover it’s a safe and steady source of fresh water. During sub-freezing weather, you can thaw the water or use a birdbath deicer. Remember that, for the sake of the birds’ health, it is always important to keep the feeders and the ground beneath them cleaned up of old seed that can harbor disease. If you have to stop feeding for a while in the winter, your birds won’t starve; they visit many feeding sites during the day and forage for natural foods. Once you resume your feeding program, your feathered friends will return. 2 Responses to Bird Feeding is Wonderful Family Fun! Larry & I feed the birds year ’round and just love to watch the activity at the feeders, esp in winter. Once in a while a rare bird will show up and that’s always an extra joy…. Thank you for your comment. You are among many who love to feed and watch the birds in their yard. It is very interesting to see those rare birds visit your yard. Happy birding!